Olotayan is an island in Roxas City which is a good place for swimming and snorkelling. Sailing, jet-skiing/flat boat riding, wind surfing, skim boarding, fishing and also seaweed harvesting are also popular activities when in the island. Legend says that a wicked giant lived in the land and has always brought havoc and sufferings to the inhabitants who turned to the “anitos” or “anitas” (gods or goddess) for help. Their pleas were heard and a strong lightning hit the wicked giant which scattered his body to the sea. The islands of Roxas City where then named after the body parts of the giant. Thus, his head and stomach (olo and tyan)became the island of Olotayan. Other islands like “Mantalinga” came from the mata (eyes) and talinga (ears), tuwad (Buttocks) and sepatos (feet). Summer is the best time to visit the island since seasonal conditions affect the beach. Strong currents and shore breaks could make the traveld to the island difficult and dangerous. Boat trip to Olotayan Island is accessible at Brgy. Banica Wharf, or ask with any beach front hotels/resort in Roxas City to facilitate your trip. 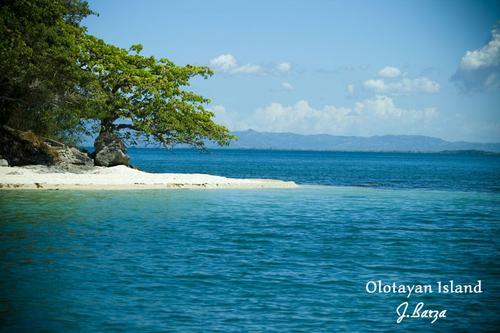 Read more about Olotayan Island.